Click our coupon link below, add the X9i to your cart and a $40 discount will automatically appear in your shopping cart! The X9i is an incline trainer NordicTrack produces and it is a great machine. Due to its massive incline range of -6% decline to 40% incline, the X9i lives up to the name of incline trainer. It can be used as a traditional treadmill as well. However, the ability to have higher intensity workouts with the large incline range at a surprisingly affordable price makes the X9i a home gym must-have and one of Treadmill Review’s Best Buys. The X9i is priced around $1,599. Want more from workouts - You don’t have to settle for lower intensity workouts any more. The X9i has the speed and inclines to challenge users to burn more calories and improve their cardiovascular fitness. Love tech - With a 7” HD touchscreen embedded in the console as well as an adjustable tablet holder, the X9i caters to tech-lovers who want a good sweat. Catching up on the latest show and media without being a couch potato. Have a variety of fitness - Whether you are a fitness beginner or advanced, the X9i can accommodate your fitness level. Quality paired with affordability - The X9i is a commercial quality machine which is generally priced at $1,599. Program options - There are 44 workout programs to choose from when you purchase the X9i. You can expand those options when you subscribe and utilize the iFit app which comes pre-installed. Attention to comfort - The X9i is outfitted with Reflex™ cushioning as well as two sets of handlebars. The cushioning simulates the springiness of asphalt without the impact on your joints. As for the handlebars, you will likely need the higher placed bars once you utilize incline levels above 30%. Footprint In Use (W,L,H): 39.6" x 70.2" x 71.6"
Motor Size - The motor in this treadmill is 3.0 CHP. It is a strong motor and transitions smoothly between different speeds and inclines. Running Area - The running area is 22” by 60”. The deck is fairly springy thanks to the X9i being equipped with Reflex™ cushioning. There is enough resistance to simulate running on asphalt but not as hard as striking pavement. Weight Capacity - The X9i can hold up to 300 lbs, which is fairly standard for NordicTrack treadmills. However, this is on the lighter side of weight capacities. It’s probably due to the treadmills incline max and cannot hold higher weights at a 40% incline. Folding - The X9i is not built to fold. Space / Footprint - The X9i will require a dedicated spot in your home, as it does not fold up or move easily. In total, the X9i is 39.6" wide, by 70.2" long, and 71.6" high. As it is an incline trainer, it is wider than other treadmills in its price range, as it requires more stability. Max Speed - The treadmills max speed is 12 MPH, which is standard for most treadmills. 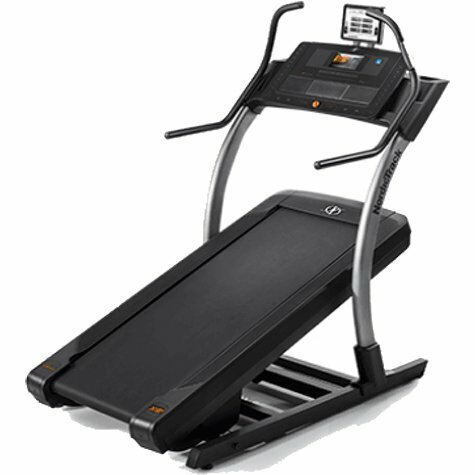 Incline - This treadmill has an incline range of -6% decline up to 40% incline. This is where the x9i really stands out and becomes classified as both an incline trainer and a treadmill. The only treadmill that even comes close to this range outside of NordicTrack is the FreeMotion incline trainers. The FreeMotion treadmills incline range is a -3% decline to a 30% incline. Workout Apps - There are 44 programs to chose from when using the X9i. You can choose to just utilize the manual function of the incline trainer but the programs help add greater functionality to the X9i. The X9i also has iFit connectivity built into the treadmill. More programs and options are available with an iFit subscription. Display - Unlike other treadmills in its price range, the x9i has a touchscreen. The screen is embedded in the console in a fixed position. This can make it sometimes difficult to see if there is a glare on your screen. Speakers - The X9i has two, 3” speakers located along the bottom of the console. They are good speakers with clear sound. Fans - Outfitted with NordicTrack’s AutoBreeze™ tech, the fans can adjust to the intensity of your workout. You can manually control the fan speed as well. The fans can output a strong breeze on the highest settings which will keep you cool during your workouts. Heart Rate Monitoring - The X9i comes with handlebar heart rate monitoring as well as a bluetooth chest strap. The chest strap has excellent monitoring capabilities. If you want an accurate idea of the intensity of your workout, we recommend you use the chest strap. iFit connectivity - The X9i comes with the ability to connect to the iFit app. When you choose to use the iFit app, you can receive more programs to utilize your X9i, receive coaching, dietary advice, store work out data and more. Tablet holder - There is a tablet holder located above the console. It is adjustable to fit a variety of tablet sizes. It is also removeable. Audio jack - An auxiliary port is located on the console so you can plug in your entertainment and project sound from the treadmills speakers. Warranties - Lifetime for frame, motor and deck, 5-year parts and electronics, 2-year labor. Customer Support - You can file an online support request, call the NordicTrack customer support line, or chat with a 24-hour representative online. Return Policy - 30-day money back guarantee with a 10% restocking fee. The X9i is a heavy duty and solid machine. It does not bounce when going at higher speeds and will stay steady while you sweat at the highest incline it offers. Its solid metal frame, motor, and deck have a lifetime warranty, so you can workout feeling secure in the knowledge that these key parts are covered. The X9i is a high quality machine from the NordicTrack treadmill line. We recommend it for all users ranging from beginners to advanced. It is an affordable incline trainer which allows users to go from -6% decline and can incline up to 40%. The X9i also has two sets of handlebars to help users feel secure while working out at higher inclines. With 44 programs and a heart rate monitoring chest strap, you can be sure to get a good workout with accurate data tracking. Overall, we recommend X9i for anyone who is looking to add intensity to their home gym workouts. We recommend you buy your X9i from the NordicTrack website. You can follow the link above and find the best deal possible or you can try to get a promo code from this site. By purchasing your incline trainer through the manufacturer, you can ensure the best price and easier use of their customer service.